While it’s too soon to blame this on state management, the first year of state-run Greater Yellowstone grizzly management has seen too many deaths of grizzly sows, a very important parameter in keeping the delisted bear population from a relisting. Story in the Jackson Hole News and Guide. Grizzly sow deaths close to upper limit. Though the population is thriving, a key indicator worries biologists. By Cory Hatch. Is it a bear or Bigfoot? Today’s blog by Rocky Barker in the Idaho Statesman. Is it a bear or Bigfoot? It is about an odd photo from Pennsylvania, said to be a “bigfoot.” Yet bigfoot has been called a creature (real or not) of the Pacific Northwest. Interest the Sasquatch is on the rise, and a biologist at Idaho State University has written a scientific book about the evidence. Sasquatch: Legend Meets Science. By Dr. Jeff Meldrum. Forge Books. 2006. There is also a layer on Google Earth that gives the location and description of sightings, footprints, etc. If there is such an animal, it clearly lives not just in the Pacific Northwest, but also the Northern and Middle Rocky Mountains, judging from the location of the reports on Google Earth, of which there are many. Those who commented on Wyoming’s wolf plan didn’t like it. The analysis of the comments has been released. Whether they lived in Wyoming or elsewhere, a majority was against it. Inside Wyoming, those inside and outside Teton County (Jackson) opposed it. Opposition was greater from those who did not live in Wyoming. Inside Wyoming, opposition was the greatest from Teton County; but even those in Fremont, Hot Springs, Lincoln, Park and Sublette counties expressed majority opposition. Here is the story. 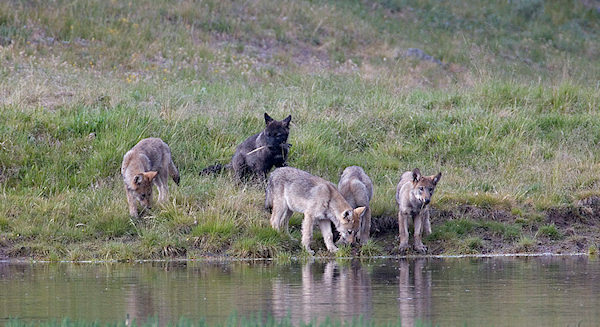 Wyoming’s wolf plan draws negative comments. Associated Press in the Billings Gazette. Here is the link to Wyoming Game and Fish’s page on the matter. It is a detailed analysis. You can read the individual comments, and I found doing so was quite informative. Here is the info on when the two documentaries we have been discussing will appear on television. Excerpt from the Bozeman Daily Chronicle. . .
“Wolves in Paradise” will be aired on Montana PBS at 7 p.m. on Nov. 1 and on other public broadcasting stations afterward. Three days later, at 6 p.m. Sunday, Montana PBS will air the national premiere of another wolf documentary, “In the Valley of the Wolves,” by Gardiner-based producer Bob Landis. The film will appear on the “Nature” program. NATURE’s In the Valley of the Wolves premieres Sunday, November 4 at 8 p.m. (ET) on PBS (check your local listings). The Missoulian has this: Brucellosis plan divides state’s cattle groups. The Montana Stockgrowers Association and the Montana Cattlemen’s Association are split on Schweitzer’s thoughts of breaking the Yellowstone region from the rest of the state with regard to brucellosis-free status. Brucellosis has been used to stir up the annual slaughter of Yellowstone’s wild buffalo by Montana’s Department of Livestock. One thing everyone seems to agree on is the need for a permanent solution to the Yellowstone Park brucellosis problem. The disease has been purged from Montana’s cattle herd for more than 20 years. The only reason it persists as a threat today is because bison and elk in Yellowstone Park carry the disease.“A lot of folks would like to see ranch practices applied to Yellowstone,” Seidlitz said. I’d prefer to see wild buffalo and elk in America’s first national park.